The UN Sustainable Development Goals (SDGs) call for balanced progress on economic development, social inclusion and environmental sustainability across nations and generations. The Australian water sector has touch-points across all 17 SDGs which provides a unique position of influence and capacity in our communities. This workshop explored more specifically, connections between Goal 6 “Ensure availability and sustainable management of water and sanitation for all” and the affect the water sector has on the other 16 sustainable development goals. Mr Anthony Slatyer (Special Adviser on Water to the Australian Department of Foreign Affairs and Trade) chaired the session, opening with a summary of the work of the High Level Panel on Water (HLPW). He suggested that the SDGs are Integrated and Indivisible and the focus is that no one is to be left behind in developing or developed counties. Distinguished Professor Cynthia Mitchell (Institute for Sustainable Futures, University of Technology Sydney) provided a thought provoking conversation on the impact and influence of diversity, especially gender, and being empowered to have a voice. Ms Mitchell also explained that health terrestrial ecosystems is also critically important to achieving the SDGs. Inspiring the workshop to share knowledge locally and globally, Ms Lucia Cade (Global Advisor to the UN Global Compact – Cities Programme and Past President of AWA), highlighted the value of business, civil society and governments collaborating on research and implementing evidenced based transformation. The Hon Karlene Maywald (Chair ICE WARM) challenged the workshop to look for the point of entry in locking in political support with an empowering story of childhood mortality being the driver for the Chief Minister of Rajasthan in establishing the Rajasthan Centre of Excellence in Water Resources Management (RaCE WaRM) and international collaboration sharing research, policy and practice. Congratulations to Dr Suzy Goldsmith, of the AWA SDG Specialist Network, for the leadership in both developing the concept, introducing the session and taking forward the workshop outcomes to inform the workplan of the AWA Specialist Network. 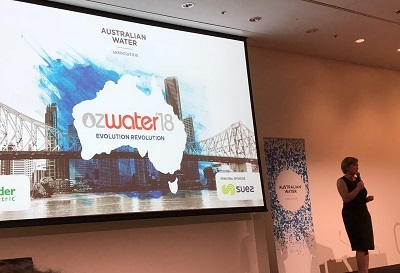 Darryl Day, Shona Fitzgerald and Kathryn Silvester of the IWA Australia National Committee supported Suzy in delivering an opportunity to engage “bottom up” in delivering the SGDs.